You have to buy a new computer. The one you’ve had all your life, it keeps showing blue screenshots that say: ” Bully! I’m too old now! I want to retire now!”. Yesterday you tried to run the Windows minesweeper and that didn’t work, you couldn’t even uncover a little square and you stayed up all night thinking about what was hiding under that minefield. Everything was a disaster, you know that. And in addition to this dramatic moment of having to say goodbye to your device, there’s a new problem: the decision about the new computer that you’re going to buy. Laptop or desktop? Life is full of hard decisions. No one can stand this. However, don’t be afraid. The eHorus blog comes to your rescue to show you some arguments in order to help you make up your mind, so that you can decide wisely. Here we go! As you can imagine, you cannot give a generic answer to this question, as it depends on several factors. For some people, a laptop will be ideal for the mobility it offers; for others, the power of a desktop will give them the solution they are looking for. So, the first thing you have to do is to ask yourself what you are going to use it for. If you want to work from a café or in a park then carrying all the items of the desktop computer might be a bit annoying. However, if you want to leave it alone on a table in order to have the maximum power to enjoy the latest video games, it probably doesn’t make much sense to buy a laptop. So that’s the first question you should ask yourself: What are you going to use it for? Let’s start talking about money. Unless you are bathed in gold, money is likely to be an important factor for you. When it comes to this, desktop computers often have an advantage. The price of laptops is often higher, and while the difference has narrowed over the past few years, it’s not uncommon for desktops to offer even more features at the same price. However, keep in mind that at the final price of the computer you will have to add the price of the peripherals. Don’t let the necklace end up being more expensive than the dog! Here, desktop computers have an advantage too. The size counts and the power of these is usually greater than that of portable devices. In addition, desktops often have better cooling, which also helps them perform better. All of this does not mean that all desktops enjoy more power than all laptops, but it does happen at equal range and price. If the performance of the computer is an important factor for you, take a good look at the differences between them. This is, of course, the main value when it comes to laptops. These are designed to be moved from one place to another, laptops offer unreachable mobility for desktops. Since, no matter how strong you may be, it will always be easier to move around with a laptop than with all the peripherals, cables of desktop computers. Nice one, laptops! This is quite similar to the previous point. Even if you don’t move your computer more than a few meters away, laptops offer options that desktops don’t have. For example, this unwise and widespread practice of putting your computer on your legs (then protect yourself properly if you do!) is exclusive to laptops. Or the possibility of storing it anywhere, without reserving a large dedicated space in the house. These are aspects that are great for laptops and have often turned the battle in their favour. Are you one of those fans of changing the components of your computer every so often? Then you should probably opt for a desktop computer. Laptops tend to be more compact and make this type of operation more difficult. In addition, a desktop makes it easier for you to take advantage of older components if you purchase new equipment. It’s a field that desktop teams tend to dominate. Its greater ability to fight overheating often means that its components last longer and take longer to present problems. 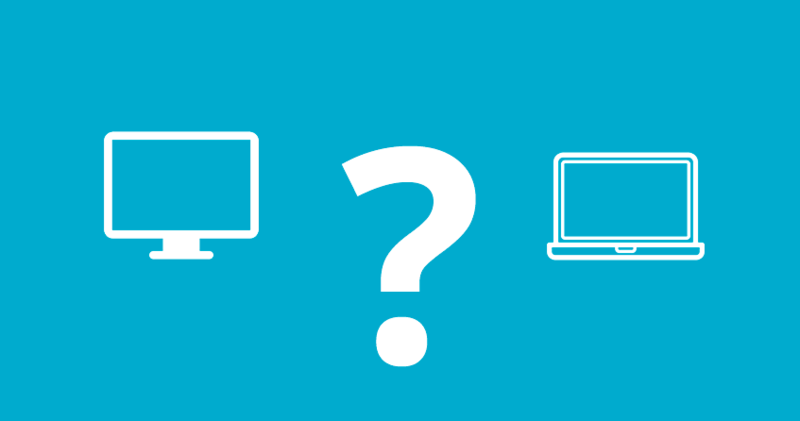 Did we help you decide between a laptop or a desktop? Remember that, after all, the most important thing will be the use you intend to make of it, so imagining what you are going to use it for will help you make the best decision. And now that we’ve seen some differences between a laptop and a desktop, how about taking a few minutes to meet our beloved little eHorus? Since eHorus wants to meet you! Ehorus is a remote computer management system (remote desktop software) that can help you with many tasks. The eHorus team will be delighted to assist you! What did you think of this article about a laptop or desktop? Leave us your opinion on a laptop or desktop in the comments section below. Our articles are read by a lot of people from different parts of the world. Don’t forget to share this article on your social networks, so that this article reaches more people. Thank you and have a nice day!